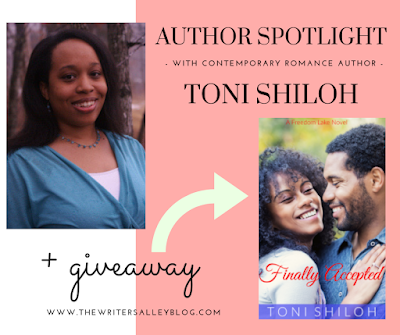 I'm going to assume that if you love inspirational romance, you know and love Toni Shiloh and her soulfully romantic stories. But if you haven't, you're in for a treat. We at The Writer's Alley are huge fans of her, her important work, and--of course--her books! A member of the ACFW and president of the Virginia Chapter, Toni seeks to help readers find authors. She loves connecting with readers and authors alike via social media, predominately Facebook. When she’s not spending time in imagination land, you’ll either find her with a book or an Xbox One controller to avoid the housework that never seems to end. Leave a comment on this post for the chance to win a Kindle copy of Toni's latest, Finally Accepted! Toni, I love the idea of a "sensitivity reader." We live in a big, big world that is also a small one, and we all belong here. If that makes any sense. I'm from the 50s, from a small town in New Hampshire of all places, and the world has certainly changed since I grew up. For the better. I write Oregon Trail and have a black family in one of my unpublished books. They'll probably be cut for space reasons, but I'm toying with the idea of giving them their own book and will put you in my Rolodex for that. Moses Jackson is a free black who buys the freedom of his wife, Dulcinea, they have two kids and set out on the Trail, but she can never believe she's free and keeps looking over her shoulder until she's finally free in Christ. The Trail was even harder for people of color because few wagon trains would take them on. It is good to hear about your work, please enter me in drawing. Toni: Your book sounds great, but I'm also looking forward to following your blog. So excited to have Toni here! Toni Shiloh is one of my favorite authors. Her stories capture me from the first page. Your book sounds exciting, look forward to reading it. Having gone thru something like this myself recently, I'd love to read this book!